Cook moongdal with 1/4 tsp turmeric powder and 2-3 cups of water,mash lightly n keep aside. Soak chana dal in hot water for 15 minutes and then drain it n keep aside. Grind all the ingredients together under"to grind" to a smooth paste n keep aside. Heat oil in a kadai, add the tempering ingredients one by one and wait till splutter n then add onion and saute till translucent. Then add chopped tomatoes and and saute till tender and then add chopped lauki n soaked chana dal,followed by chilli,coriander n cumin powder. Stir fry the vegs with the dry powder for 1-2 minutes and then add cooked n mashed moongdal. Add enough salt n little water(to desired consistency) mix everything well and allow to boil. When the lauki moongdal mixture starts boiling add the coconut paste and cook in medium heat till the raw smell leaves. Lastly add some finely chopped cilantro n switch off the flame. It's done...Lauki moongdal curry is ready to serve.This goes very well with chapathi,dosa n hot steamed rice also.I love this with chapathi n dosa. Can try this curry with other vegs also like chayote,turnip,radish etc. Coconut paste is optional but it gives nice taste n flavor. Adjust the chilli powder n green chillies to your taste n spice level.the above measurement will give a mild spice curry perfect with rotis n dosa. 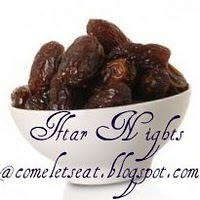 Linking this recipe to the ongoing event,Iftar nights @ Jabeen's corner . :-) Nice one. I love this rice and my Hubby loves this with roti.. This looks delicious...love with roti..
Kootu is my favorite .. looks good Sangee. My mom do make a curry similar to this which I love.But so far I didn't have the recipe,now I can make this yummy curry without calling up my Mom.Thank you dear. Healthy and yummy sabzi..love this with roti..YUMM!! awesome recipe dear..thanks for sharing! We make it in a similar way,urs sounds great,can have both with rice and roti! Very healthy, yummy and delicious dal. Perfect with roti. Nice presentation. Nice and healthy.. Its good to use bottle gourd,turnip,radish in this type of curries as it is mostly avoided.. Ultimate combo, lauki & moong works out wonder together, can have it with anything..
Hi Sangee, You are my blog hop pal for this week and I'm browsing your blog for the last 1 hour. You have got so many yummy recipes, I'm confused what to try for the event :-) You have a really nice blog with lot of tamilnadu dishes which I like. super curry,perfect for roti...my mom also makes it in a similar way!! Delicious one and super healthy too. very nice and healthy recipe...I make this with chana dal..Moong dal will be a nice change..